Yaverland Retreat Self Catering Barn is a real find! If you are looking for stylish self catering accommodation in the New Forest that is peaceful, comfortable and just a stones throw from the open forest and the towns of Lymington, Sway, Brockenhurst, then please give us a call to check availability. - a small kitchen area with a twin hob / fridge and sink. A kettle, toaster, plates and cutlery etc. are all provided. The barn is fully self contained and is accessed by a gravel driveway where you can park directly outside. We stayed at Yaverland for 3 nights over the August bank holiday and cannot recommend this property enough! Located very close to the New Forest, this place is perfect for exploring. The barn itself is well decorated, modern and clean and the bed very comfortable! Emma and Gavin were very friendly and welcoming hosts and the kindly supplied us with milk, coffee and tea, butter, crumpets and biscuits! We came away feeling very relaxed and would definitely stay here again! Comfortable, clean, well-equipped and within a short distance of some beautiful woodland walks. The hosts are very friendly and accommodating and the pygmy goats and Shetland ponies make great neighbours! 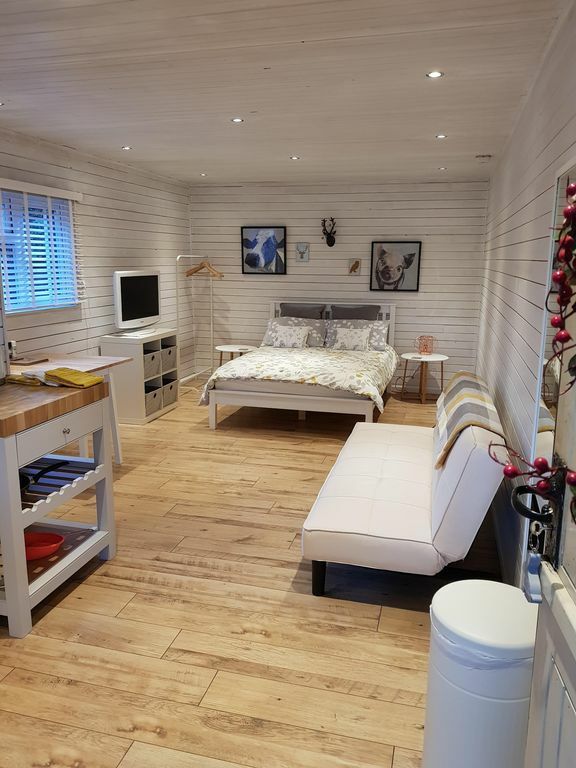 The chalet is compact and simple with all necessary cooking and showering facilities provided, including towels. Parking is provided just outside the door so unloading and packing up is easy. Tiptoe is just a few minutes' drive from New Milton and within easy reach of Barton-on-Sea, where a great breakfast is served at The Beachcomber Cafe. Milford-on-Sea is also close by and is a lovely setting for a walk overlooking The Needles off the Isle of Wight on a clear day. The Yaverland retreat at Tiptoe is a great base for exploring the New Forest.